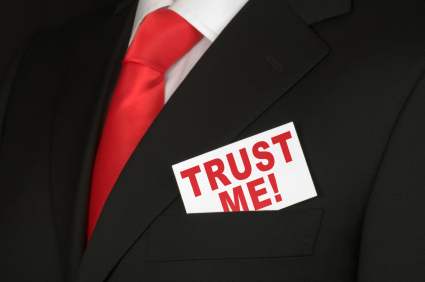 Your clients chose you as their SEO agency because they have complete and utter trust in your capabilities, right? So why do they keep calling to check up? Why can’t they just let you do your work and report back to them when you’re finished? Well, because they probably don’t completely trust you. Because you probably did a crappy job of ensuring they could trust you. To companies, their website is their baby. Handing over their FTP info to a new agency is like handing the house keys over to the new babysitter. Will junior be ok for a few hours? Will they remember to feed him and bathe him and not let him play in traffic? Did they make the right decision!? Websites have become the cornerstone of our businesses, the hub that all of our marketing efforts lead back to. If something goes wrong, how will the business fare? The solution (to most of life’s problems, actually), is in managing expectations. The key to managing client expectations is to be as open as possible, from day one. Make sure you outline all the whos, whats , whens, wheres and hows that your company intends to use. And then follow through. In your proposal or on your webiste, include short bios of your employees or key management personnel. Give an overview of their expertise and experience, so your clients know that you haven’t just picked the closest “social media guru” to handle their account. Outline the goals you plan to accomplish, and how you plan to implement them. You’re going to increase their rank, that’s great. Will you be performing keyword research? Will you be suggesting on-site changes? Will you be doing link development? Outline all of your plans. Discuss how you plan to measure your goals and whether this will be done on a regular basis, or at the culmination of the project. Explain your timeline, from when you will be working on various stages, to when you will provide deliverables. If they expressed a need to have certain work completed before a specific deadline, make sure you address that. And if you can’t make a deadline reasonably, tell them why. If parts of your process will require materials from the client (even payment! ), be clear that any delay on their part will hold up the entire project. Severe delays may cause the entire project to be rescheduled. Your company provides a specific set of services. Your team has a specific set of skills. If a client comes to you wanting something outside of that, be honest in your abilities. You can’t be all things to all people. However, you can suggest other service providers in that area that you trust. Or you could be willing to work with sub-contractors on that specific part of the project. Let your client know what you are and are not willing to do, and they will appreciate that. Establish ground rules for contact that both parties can agree on. Some clients may require a weekly check-in on progress, others only monthly. The nature of client work means you will have to be available to them at some point. Set that up initially so that the client knows what to expect and is never wondering when they will hear from you next. Of course, there are going to be reasons for more informal contact, so let your clients know you are available to answer questions or concerns during the process, and that if you have any questions you will be sure to be in touch. If you are working on something collaboratively with the client, communication may be more frequent, even up to several times a day. But if you start spending all your time communicating with the client rather than getting their work done, you’ll want to rein that in. Have a chat and remind them of the timelines and due dates you outlined in your proposal. If the client has a set number of hours per month, remind them of their time allowance and that all communication time is taken from this total. If you keep specific hours – especially if they are outside of the normal 9-5 day – ensure that your client is aware of those and at what times you are available to them. And if you are working in a different time zone, ensure that they know the conversation, so they don’t try to call at 2am. Stay on time with your deliverables. If you promised a report by the 30th, have it in their hands no later than the 30th. Staying on time allows clients to feel comfortable that you’re holding up your end of the deal. If you fail to do that, how are they to know that you won’t fail at their SEO efforts? Of course, there are times where we can’t make deadlines. You over-booked your staff, and there simply aren’t enough hours in the day. Someone on your team had a family emergency and got called out of town 3 days before the deadline. These things do happen, and sometimes they are out of our control. In that case, let your client know with as much advanced warning as possible. Don’t make excuses, but outline the problem. And let them know what you can deliver to them, and on what day. You’ve got all but the last section of the report done? Great, send them that, and tell them when to expect the remainder. Get other staff members to help, stay late, work a Saturday, whatever it takes. Most of all, it comes down to communication and being thorough about it. Often when you feel a client doesn’t trust you, it’s because you’ve failed to communicate something about your process to them. It’s ok for them to call and check on junior once in a while, and they’ll probably find that he’s in good hands.